Seeking closure, a dead musician returns as a ghost to the home he shared with his wife. The American indie distributor A24 has drawn the ire of mainstream US audiences recently. 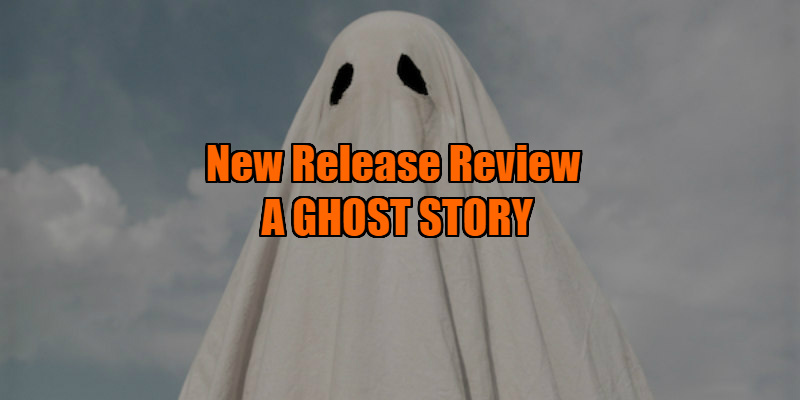 Cinemagoers have complained that movies like Robert Eggers' The Witch, Trey Edward Shults' It Comes at Night and now David Lowery's A Ghost Story have been misleadingly marketed as horror movies. I assume when they say 'horror' they mean the sort of bland, uninventive filler that comes out of the stables of James Wan and Blumhouse, as The Witch and It Comes at Night most certainly qualify for such a genre designation. A quick google search for the definition of 'horror' returns the following: "an intense feeling of fear, shock, or disgust." Few movies of recent years have invoked such an intense feeling of fear as the aforementioned pair; it seems however that the average horror audience member is more interested in the "shock, or disgust" part of that definition. Accusations of misleading marketing by A24 are baffling when it comes to A Ghost Story. Nothing in its official trailers suggests it's a film designed to create an intense feeling of fear, shock, or disgust. Unlike the other two movies mentioned, A Ghost Story most certainly isn't a horror movie - it's a love story, though perhaps one concerned with the unrequited variety. Lowery's film does open like a traditional horror movie, with something going bump in the night in the soon to be vacated home of a young couple, C (Casey Affleck) and M (Rooney Mara, an actress who seems to have cloned herself in order to appear in every other movie released in 2017). They're all set to move out of the home they've resided in for the past few years, though C is unhappy with the move, leading to resentment between the pair. In bed at night, they appear besotted, but in their waking hours there's a lack of communication between the lovers, with C seemingly more engrossed in creating music than paying attention to his wife. When C dies in a car crash outside his home, he later rises from the dead in the hospital morgue. Returning home shrouded in a bedsheet with two eye-holes cut out, he observes M in her grief, unseen by her or any other living souls. 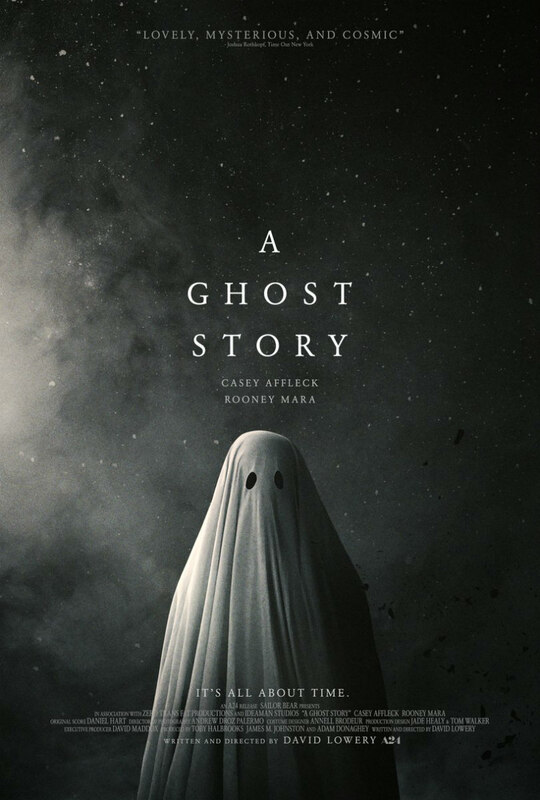 For its first half, which focusses on C's observations of M, A Ghost Story is engrossing, turning what could be a laughable conceit into something genuinely affecting. It's when M ups and leaves the house that the film struggles to recover. C stays behind, observing a series of new tenants over what appears to be centuries, the film's rural Texan neighbourhood giving way to a Blade Runner-esque cityscape. With C clad in a sheet and M out of the picture, it means the film's two talented stars don't actually appear on screen for most of the running time. There's very little dialogue in the movie, and what little we get feels didactic, especially a drunken lecture from musician Will Oldham, whose verbal ramblings about the importance of creating art come off as overly self-important. Much has been made about a scene in which a grief-stricken Mara devours a fruit pie. Its length has been greatly exaggerated; though it may test the patience of less tolerant viewers (particularly anyone who thought they were getting The Conjuring 3), Lowery cuts it just before the juncture where it might morph into absurdist comedy, but also at the point where his lead actress seems on the verge of creating something truly memorable. I couldn't help but think of the infamous scene in Andrzej Zulawski's surreal masterpiece Possession in which Isabelle Adjani has a miscarriage in a Berlin underpass. It's a scene that lasts so long that it begins with audience bafflement, then becomes absurdly amusing, but ultimately develops into one of the most disturbing scenes ever filmed. If Lowery had indeed allowed Mara's pie consumption to last as long as many are incorrectly reporting it to, it may well have stood alongside Zulawski's. As is, it's a reminder that even American indie cinema is subject to the whims of an impatient audience. A Ghost Story's reluctance to commit to its fascinating premise results in one of the great missed opportunities in recent cinema. A Ghost Story is in UK/ROI cinemas August 11th.